Elizabeth McGuire behind the counter at her new bake shop. Elizabeth McGuire is clearly insane. How else do you explain her decision to open a new business with “Scottish twins” (a 25-month old son Owen and 13-month old daughter Esha) at home and a husband (Scott) who travels for work one week out of every month. Oh, and did I mention the business involves having the owner wake at 3 a.m. every morning to bake! “Multiple people have told me I’m a masochist,” she laughs. McGuire opened the East Side Bake Shop in McGee Creek last month. Her shop occupies a section of the former McGee Creek restaurant, which has not operated since 2010, and there is outdoor seating. You can see the “Bakery Open” banner from the highway, and the shop is located a stone’s throw from the McGee Creek turnoff on 395. 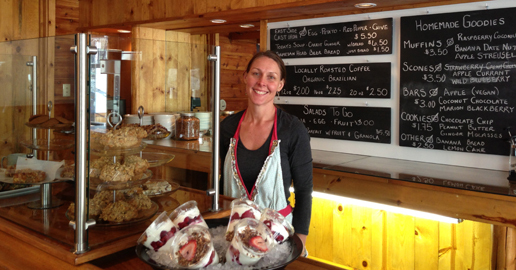 As McGuire tells it, her idea to open a bakery in McGee began to take shape in 2010. A McGee resident since 2006, she was commuting to Mammoth every day to a sales job at 80|50. “I always thought to myself, what a perfect spot for a coffee shop,” as she drove past every morning. Two days prior to having her daughter Esha last year, McGuire approached McGee Creek owners Martin Roberts and Dan Witte about her idea, and they were receptive. Now, a year later, she’s up and running. McGuire baked all through college in West Sonoma County, so she’s used to the early morning routine, and she lives within 100 yards of the shop. She says the business to date has been almost entirely local, and more than she imagined. “It’s filled a niche,” she says. She also has gluten-free offerings and makes gluten-free granola. This weekend, she will debut a few new menu items, including lemon bars, raspberry bars and gluten-free fig bars. She also serves coffee and lunch items, including soups, salads, quiche and frittata.